One of only three commercially grown fruits native to the United States, cranberries offer a multitude of health benefits that can help ward off cancer, heart disease, diabetes and bacterial infections. It is unsurprising that cranberries have so many health benefits, considering the fact that the cranberry plant is a close relative of the blueberry, another superfood known for its incredible healing properties. Most of the cranberries in the U.S. are derived from Massachusetts, which prides itself in being the nation’s number one producer, thanks to 14,000 harvested acres of cranberry bogs, most of which are cultivated by small family farms. Like other berries, cranberries are very high in antioxidants, making them a great resource for boosting the immune system, particularly during the cold winter months when seemingly everybody is getting sick. Approximately 400 million pounds of cranberries are consumed each year in the U.S., with one fifth of them being eaten on Thanksgiving. These red pigmented tart berries have a long history in the U.S., as they were first used by Native Americans to fight scurvy, a disease brought on by vitamin C deficiencies. Cranberries proved beneficial in earlier times, as they were used to dye porcupine quills for clothing and jewelry. Native Americans also used the berries for other medicinal purposes, including as a blood purifier, as laxatives, and to treat fever, stomach cramps and even childbirth-related injuries. Today cranberries are just as important, as they’re routinely used to treat a variety of ailments due to their antibiotic qualities. Loaded with proanthocyanidins, or antioxidant compounds, cranberries are great for preventing urinary tract infections by preventing bacteria from binding itself to the cell walls of the bladder. These same compounds stop bacteria from multiplying, and actually flush them out of the body through urination. Studies show that regular intake can prevent recurring urinary tract infections in middle-aged and pregnant women. Cranberries have also been proven to inhibit tumor growth due to the presence of polyphenolic compounds. Phytochemicals found in cranberries have the ability to block the activity of cancer cells, preventing them from growing out of control. Scientists have identified five ways in which cranberries defeat cancer cells, three of which inhibit cancer-causing agents and two that simulate the destruction of tumor cells. Cranberries have the remarkable ability to suppress certain types of protein enzymes that cause inflammation, which if allowed to duplicate could lead to cancer cell growth. Cranberries are also able to block an enzyme called ornithine decarboxylase, which can lead to tumor growth, particularly causing breast cancer. 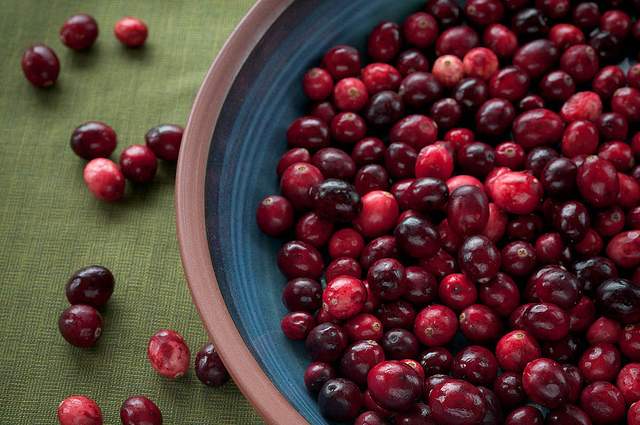 Another way cranberries fight cancer is by unlocking certain enzymes that kill cancer cells. For example, antioxidant compounds found in these red pigmented berries kick-start the activity of a phase 2 detoxification enzyme called quinone reductase (QR), which offers protection against chemical carcinogenesis. Research has proven that cranberries are very effective at initiating apoptosis, or programmed death of tumor cells. Flavonoids found in cranberries are so rich in antioxidants that they may decrease the threat of atherosclerosis, a disease in which the arteries are narrowed due to a buildup of cholesterol, fat and calcium. This type of buildup can obstruct the body’s oxygen flow, which may result in a stroke or heart attack. Cranberries’ natural compounds have been shown to suppress the oxidation of low density lipoprotein (LDL) and beneficially stimulate the blood platelets, according to researchers.